Our yoga starts with concepts from ancient India, spiced up with a Japanese twist, and blended with the ancient fundamentals of Chinese medicine. A powerful tool for health and wellbeing, the COTY style of Remedial Yoga is like nothing you’ve done before. The concept of using yoga as a therapy is a relatively modern idea as far as yoga is concerned. In the true yogic form, therapeutic yoga has adapted and grown, integrating traditional yoga concepts and techniques with western medical and physiological knowledge. So what is yoga therapy, exactly? Our explanation is relatively simple. Yoga therapy is a habit-changing therapy, which gives us a systematic approach to replacing old, unhealthy habits with newer, healthier ones. 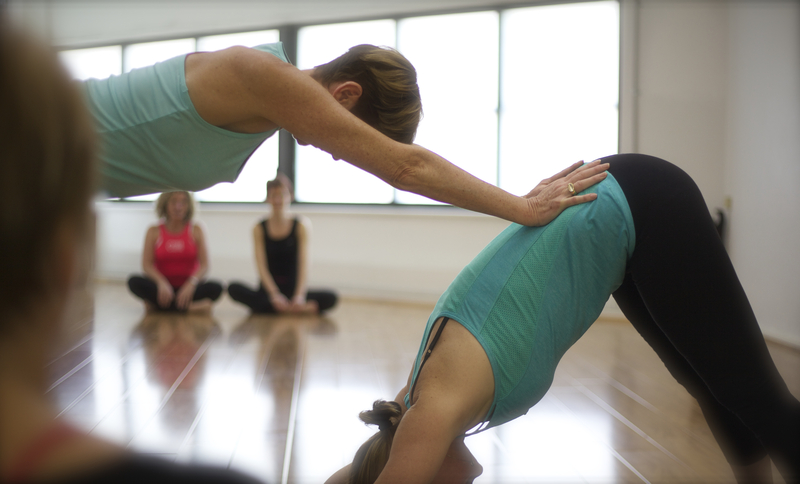 Try it for yourself – book a Remedial Yoga Class here. Remedial Yoga Therapy (RYT) is based on the understanding that, in our busy modern lives, we really only have control over a few basic things – how we breathe, the way we move, and what we eat. By working with these three aspects of our lives, we can make positive, lifelong changes in ourselves and those that we share this knowledge with. With a strong conscious mind-body connection and spacial awareness of the body, we can start to see a realistic picture our ourselves, a concept now known in modern medical terms as “proprioception”, which allows us to cultivate flexibility, ease of movement and correct body alignment. Once the body is working at an optimal level, we can then achieve holistic balance. RYT therapists work to harmonise and balance the body, building strength in areas as required to allow for flexibility and release in areas that are taking on too much of the workload. Coupled with other theories of holistic health (especially oriental diagnosis and Traditional Chinese Medicine), RYT does not only assist in treating musculoskeletal issues such as neck, shoulder and general joint issues, but can ease pain and symptoms of people suffering from Crohn’s disease, multiple sclerosis and PTSD. It can also give people the tools to cope with rigorous treatment protocols as they fight through rehabilitation and chemotherapy. All in all, RYT is one of the new heroes of complementary medicine that works to create, stimulate, and maintain physical, mental, and emotional health, and spiritual wellbeing. Remedial Yoga Therapy draws directly from the universal philosophy of the Five Elements system, most recognised as the foundation of Traditional Chinese Medicine. Japanese Shiatsu also emphasises the linkage between the Five Elements and the meridians of the body, through which qi (energy) may flow freely. Five Element Shiatsu seeks to remedy obstructions in qi flow or balance of yin and yang energy in a meridian through therapeutic bodywork and physical manipulation ‒ which is why RYT has come to be based on this truly holistic method of healing, and why the theory of the Five Elements is at the core of all our courses and workshops at COTY. We teach students how to access and manipulate the meridians with RYT postures, movements and breathing techniques, so they understand how to correct the imbalances caused by common health conditions. Since the same elemental energies that correspond to the body meridians are linked to the seasons of the year, we also teach students to recognise which meridian postures and sequences suit the present season and corresponding element. 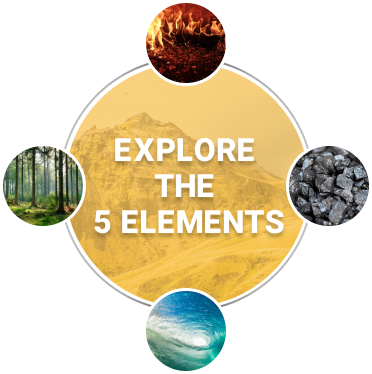 Explore the five elements below and learn more about the yoga and lifestyle we promote at COTY. When your Earth element is balanced, you are able to draw what you need from life – to nurture not only yourself, but others in return. The Earth element is our like our mother giving us what we need when we need it, including some tough love now and again. The Earth element coordinates cyclic patterns in the body, such as breathing and eating, so that you are able to transform the foods you eat and the air you breathe into energy, immunity, warmth, and even creativity. We look to balance the Earth element through the Stomach and Spleen meridians. The Stomach controls your intake and habits, and the Spleen your capacity for desire, which keeps us seeking out what we need to be well. This, in turn, ensures a healthy blood quality that nurtures the mind, body and spirit. Think Earth, think nurturing, loving Mum. They say you should not let your heart rule your head, but according to Chinese Medicine, the Fire element – through your Heart and Small Intestine – represents how you feel about yourself and others. It gives you the ability to love and share the feelings of contentment with the world around you. The rising energy of Fire helps you decide who you want to be close with, when you want to be warm and open with others, and how to extract what is vital to life through from the foods you eat. If your Fire element is in harmony, it’s okay to let your Heart be the Emperor of your body, keeping your lifeforce healthy through good circulation, good digestion, laughter, and happiness. There are really two more meridians that form the Fire element, referred to as Fire II. These are the Triple Heater and the Heart Constrictor (or Pericardium) meridians. These govern our ability to protect yourself when you need it and open your heart to others when the time is right. The Metal element is about contracting energy that gives you the ability to choose what to keep and what you can get rid of. Metal, with the help of the Lung and Large Intestine, controls what your body decides to keep or excrete from the foods you eat. It also helps you choose what emotions and thoughts will keep your mind and body vital and decisive, making smart choices to keep you in balance. A balanced Metal element will show in the glow of your skin and hair reflecting a happy, healthy and strong you. Your Water element gives you the ability to walk tall, hold your head up, and have a backbone (or spine) thanks to the Bladder meridian, which controls the strength of your entire back body. It’s partner meridian, the Kidney, is keeper of the qi that you are born with – energy known as Jing in Chinese medicine. This is a finite amount of lifeforce energy that cannot be replenished, so keeping your water element balanced really important. One of the biggest enemies of your life force is stress, and the Kidney happens to control your ‘fight and flight’ stress response with your adrenals. In yoga, we look for optimal use of our energy to keep the Water element balanced by using only the energy we need to get things done. Effortless action for long, calm healthy lives – that’s what Water element is all about. Let your imagination run wild. The Wood element governs how flexible you are, but this means more than touching your toes or being able to do that binding pose. When your Liver and Gallbladder meridians are balanced, you are not only flexible in the body, but in the mind as well. The Liver meridian feeds your imagination, whilst the Gallbladder helps you put all those great ideas into action. The Wood element helps you solve problems with clear vision and determination for success. With clear insight, you will develop a free flowing mind and body allowing your spirit will soar. Twist your way to a happy Wood element. Ready to experience COTY’s extraordinary style of yoga? Come visit us on one of our informational open days and get a taste of it for yourself.